Until college, I didn’t even know that it was possible to make brownies from anything other than a box mix. I know my mom is just dying somewhere reading this, but you have to know that I’m not blaming her. Lady knows her way around a kitchen and can bake fabulous goodies from scratch in her sleep. *But* we did use box mixes for brownies fairly often (because they’re awesome), and somehow the fact that such delicacies could be made in my own kitchen just completely eluded me. My jaw dropped. From scratch? What kind of a magical culinary genius was my roommate that she could promise such things?? After the brownies, we had nearly weekly baking lessons. Every time she went into the kitchen, I was at her elbow peering into her magic bowls. She taught me how to make all sorts of fun things (like caramel corn), and I had a blast learning from her. In return, I taught her some of my own specialties… like Ramen noodles with scrambled eggs. Obviously, I had the better end of the bargain. I’ve been using this brownie recipe for about 6 years, and it’s my go-to recipe for brownies. Others have come along that I really, really love. But I appreciate how basic and foundational this recipe is. It’s simplicity makes it ideal for creating variations. For more cake like brownies: use baking powder instead of soda and whisk the batter to add air. Don’t like all the chocolate chunks? Use 1 cup of chocolate chips, or use mini chocolate chips (or omit altogether)! Like a firmer (rather than fudgey) brownie? Bake for 5-10 minutes longer until a toothpick inserted comes out clean. Preheat oven to 350 degrees F. Line a 9x9 baking dish with parchment paper. Beat together the butter, sugar, and vanilla in a stand mixer bowl. Add the eggs one at a time, mixing well between each addition. Stir together the flour, cocoa powder, and salt. Gradually add the dry ingredients to the butter mixture. Mix in the baking soda. Mix in the chocolate chunks with a wooden spoon or spatula. Once the batter forms (it will be thick), scrape it into the prepared dish and spread evenly. Bake for 25 minutes, until brownies begin to pull away from the side of the pan. Mmmmm…yay for brownies! These look delicious! I cannot wait to make these!! I am always looking for a new brownie recipe! These brownies are purrrfect! I love em fudgy and all of those chocolate chunks are SO genius. LOVE. These look absolutely delicious! I recently make brownies, but they look…and I’m sure taste nothing like these. Made these this evening and they were awesome! My family loved them! This is a keeper. Thanks! I’m with you on the chunks of chocolate in my brownies! Yum! This recipe looks so amazing!! There is nothing like homemade brownies!!! While I love the convenience of box mix, there is something so satisfying about knowing you made the batch from scratch. I love chunks in my brownies, too! Oh my — those are fudgey! I’m in love! And uh, I have only made “homemade” brownies like, twice in my life. Haha, there’s just something way easier about box mix, but this recipe may just change that! 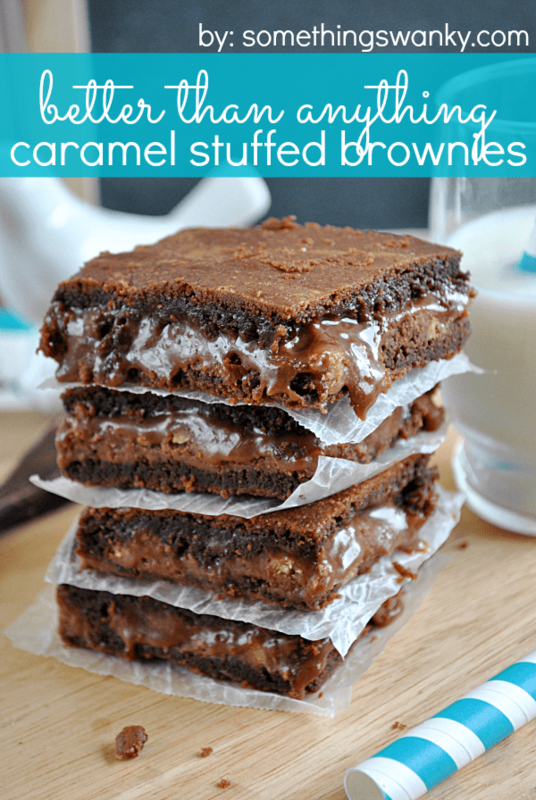 I’m kind of a box mix brownie kind of girl, but I’ve been looking for a from scratch alternative. These look simple and good, so I think these might become my go-to as well! Holy moly these brownies look fantastic! I will need to make a pan or two of these stat. Oh what I would give to stuff that into my face right now! 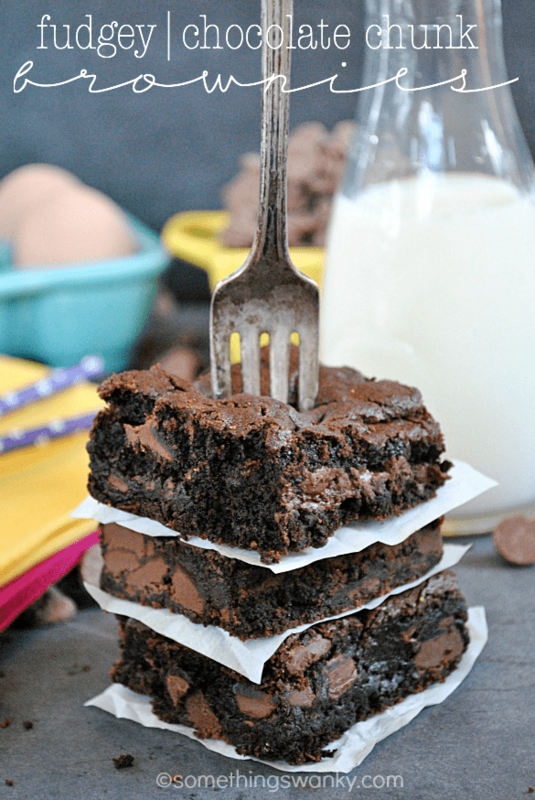 Looks like a fantastic brownie recipe Ashton – love all those chunks! 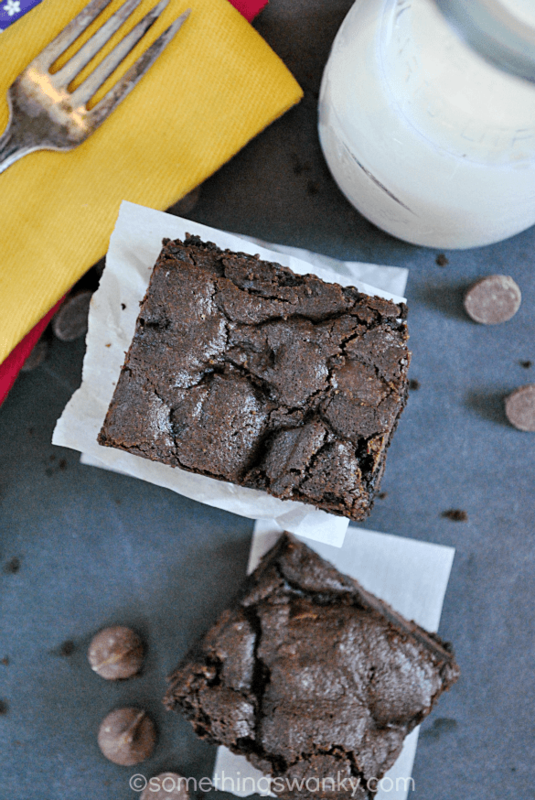 Brownies with a chunky texture to them are THE BEST! These look wonderful. Ashton these are gorgeous! I love all the chocolate chunks; YUM! I just made these, and I am in love. Thank you for sharing!!! These look heavenly! 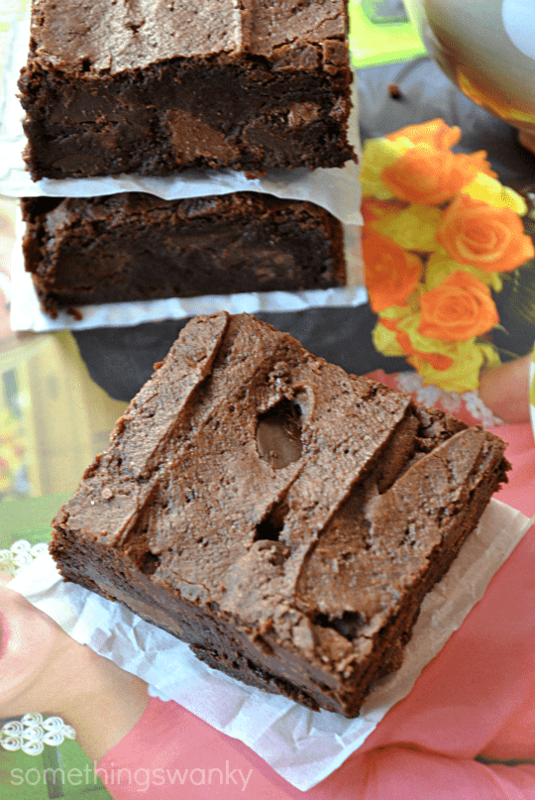 Fudgey + Chunky = Brownie Perfection! I made these yesterday and they are SO fudgey and delicious! This is definitely a keeper recipe! Quick question…is it unsweetened or regular cocoa powder? I bought some Special Dark cocoa powder, but don’t know if this will make it too sweet. You can use special dark– it’s not sweetened, so that’s perfect! Totally fine! I wouldn’t used unsweetened though..
Just made these. I would have never dreamt of putting that many chocolate chips in brownies. The volume of the chips equaled that of the batter. Best brownie I have ever eaten. No crustiness even on the edges. Smooth creamy chocolatey goodness. More like an intense chocolate delivery system than a brownie. What type of chocolate chunks do you use? Quick question, can I substitute baking soda with baking powder? If so, will it be the same quantity? Hi! This looked so wonderful that the day I found it I made it later that night. However it turned out more like a lava cake rather than a fudgy brownie. It only became more of a brownie the next day. I am such a chocoholic that it didn’t matter. However what can I do to make it a brownie earlier so that I can make it for parties? It may just need a little more bake time in your oven (they all seem to be so different! The ovens in my last 3 apartments have all been TOTALLY different in their bake times for the same recipes… I try to usually post a range or provide another means of gauging done-ness because of that :) ). How long did you bake for? dumb question lol!…what do you mean by chocolate chunks. …do I buy a chocolate bar and cut it in chunks or is it something sold in the baking section of the grocery store? These are in my oven for tomorrow’s baby shower. I haven’t made your recipe before bit you’ve never led me wrong! I know these will be amazing (the batter already is!). Thanks for another great recipe! Just made these tonight. Fabulous! Love the texture, easy to make. Thanks! Recipe sounds great! Based on your experience from these brownies what would be the best cocoa powder to use.? 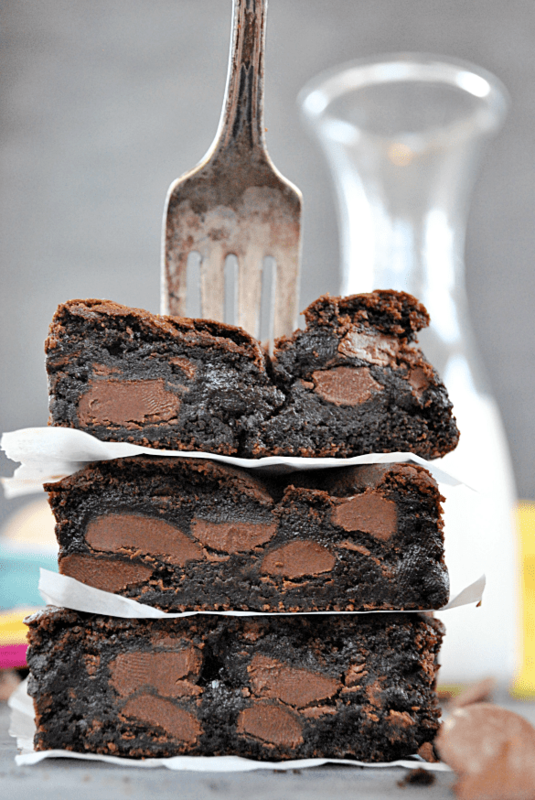 I love baking and have yet to find the perfect brownie recipe, but these might be it. Just made these delcious, chocolately chunky rich brownies. They were heavenly, thank you for sharing your recipe!!! I made these brownies with a mixture of Nestle cocoa powder and Hershey’s special dark cocoa powder. They were dense, melted in one’s mouth, and are a recipe staple. i made these with hershey’s special dark cocoa, one cup of hershey’s semi sweet choc chips and one cup of white choc m+ms. they were AWESOME!! thanks for a super easy recipe! These are amazing! I made them today and couldn’t get enough of them. 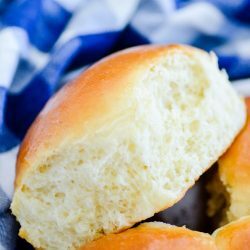 They are going to be my go-to recipe now! I LOVE fudgey brownies. But, when I followed the recipe it turned out more cakey and also not as dark as the ones in your pictures. What am I doing wrong? 2 things, possibly… If you used a whisk attachment, you might have allowed too much air to form in the batter, making it cakey. You want to use the dough paddle in this recipe. And then, I’m wondering if you added all of the ingredients into the bowl at once? Or did you add them in the order listed in the recipe? It can make a difference, even though it seems silly! Hi there… I had a ton of extra Halloween candy left over this year, so I chunked up a bunch of Coffee Crisp bars (Canadian deliciousness) and used them instead of the chocolate chunks. Threw in some chocolate chips to round out the 2 cups worth. I also added in some espresso powder to the mix – figured it’d be a nice fudgey, mocha brownie. Yum!! The best brownies I have ever had. Thank you! I am sorry to say this was a swing and a miss in my opinion. I do have to say I am not what u call a “true chocolate lover”. Don’t get me wrong I do love chocolate. But from what I’ve been told true chocolate lovers love dark chocolate. Whatever that means. :) I’m a milk chocolate girl. I must like the extra sugar. :). I have made many things from something swanky and this is the first I haven’t loved. Maybe the family will though. I will still defiantly be followings this blog. These brownies were exceptional! Can you say “chocolate overload”?! I just love a gooey brownie and this one ticks all the right boxes in my opinion. I have a question… say I wanted to double the recipe to make thicker brownies… what would that do for my cooking time? These are so tasty, I added chopped walnuts and used half chocolate chunks, and half dark chocolate chips. Insanely good!!! Whipped up a batch of these for my New Year’s Eve movie night with my bestie. Such a wonderful treat! After pinning this weeks ago, I finally baked your brownies. They are SO GOOD! By far, the best brownies I’ve ever eaten. Even better than the ghiradelli box I like. THanks for a fantastic recipe! Unsweetened :) I didn’t even know they made sweetened cocoa powder! If I wanted to make it in a. 9 by 13 pan do I double the recipe? Thank you for this! This is perfect!! I am no god at baking – got this right teh first time! Turned out fudgy and chewy and the chocolate chunks…. mmmmm…. I am doing ti again for my big big big fancy family dinner. Chocolate chunks will be white and milk chocolate mix. I love this! I’ve got these in the oven now. They’ve been in there for a little over 35 min. but when I stick a toothpick in they;re still really liquid-y. Is that normal? Should the toothpick come out clean like with other brownies? Since we don’t get chocolate chunks around here, I will have to chop up chocolate bars myself. Should I use regular chocolate bars or those meant for baking. If I use regular ones, won’t they melt? Awesome recipe! I gotta confession, I have never had much success with homemade brownies until your recipe. I made these over the weekend to take to a BBQ, and my family LOVED them. They devoured them! I will definitely be making these again and again. They asked for a double (or triple) batch next time. Thank you for a great recipe!! Okay…. I need to say…. those are THE BEST BROWNIES EVER!!! Every time I make them, I have to make a double recipe, and every time I take it to work people LOVE IT!!! Thank you so much!!! 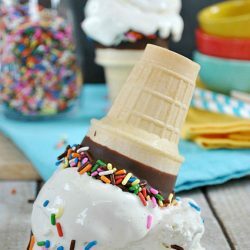 I have tried this recipe before and it was ABSOLUTELY YUM! But now I want to double the recipe and make, so how should I adjust the baking time?